It isn't too hard to connect yoga asanas and prayers to each other. Yoga has always been about more than just the physical body; it is descended from a tradition of Hindu religious beliefs. While most U.S. practitioners do not directly subscribe to those beliefs, they are integral to the mental state encouraged by most yoga instructors: trying to center the body and mind and calm the spirit, and feeling the energies of the body opening and moving outward. 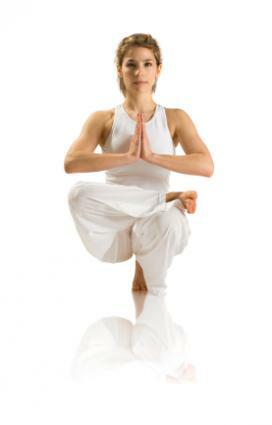 Some yoga poses include the hands in a prayer position. These poses mimic the palms-together position of several Christian denominations. While the pose itself is not significant in the religious sense - in fact, it is usually simply a transitional part of other poses - using the word "prayer" helps students know the proper placement of the hands, whether it's used to integrate Mountain Pose into a standing back bend or as a technique for opening the groin in a squatting stretch. However, while the prayer pose in the Christian tradition could be viewed as a method of reducing the distractions of the body (no fidgeting hands, for example), the asanas in yoga are almost the opposite: they are designed to focus attention on the body. Director David Frawley from the Vedic Institute in New Mexico defined asanas as "right orientation" towards a practitioner's body from a psychological perspective. The asanas that a good yoga instructor assigns an individual are about more than just the physical body - like prayers, they are about addressing the needs of a person's state of mind, as well. By paying attention to the various demands of asanas, students are forced to step outside of everyday distraction and focus more on the meditative state. Just as the physical act of counting a rosary can help focus the mind on a prayer, the yoga asanas use the entire body to intensify the mental state. Rather than apply the Hindu traditions to the asanas, some yoga instructors relate them directly to their own beliefs and faiths. For example, in the Warrior pose, in addition to focusing on breath or opening up, a Christian Yoga instructor might also suggest a scripture about being "soldiers for Christ." A Jewish Yoga instructor, similarly, could use the Mountain Pose to support the doctrine of keeping grounded in the world while expanding the spirit towards heaven. Many religious people who might have otherwise balked at doing yoga because of its Hindu roots are finding it easier to relate to the exercise when they combine yoga asanas and prayers. In this way, they use the time spent practicing yoga as a sacred connection to their bodies and spirit, which is the foundation of yoga. A number of well-known yoga practitioners, including Lilias Folan, speak highly of their relationship to God and the impact yoga has on strengthening faith. Enthusiasts in this new interpretation of yoga have been spreading, with databases of Christian yoga instructors being created and Jewish yoga teachers relating the shapes of some poses to the letters of the Hebrew alphabet. This form of yoga, created in Boston by Joseph Rapp and known as "Aleph-Bet yoga", is designed to help students maintain a focused intention during the pose, something integral to all yoga practice. However, not all of the religious leaders are happy with it. Before he ascended as Pontiff, Pope Benedict XVI was quoted as warning against yoga and other meditative exercise programs because they might "degenerate into a cult of the body." Likewise, Hindu religious authorities as well as yoga experts have expressed concern about the idea that yoga can ever be done outside of the context of its founding religion. Professor Subhas R. Tiwari of the Hindu University of America has gone so far as to call it "hypocrisy," feeling that taking the Hinduism out of yoga is both insincere and a measure of disrespect and intolerance. Regardless of the reasons for combining yoga asanas and prayers, the benefits to the physical practice of the poses are almost indisputable. A healthier body almost always contributes to a healthier state of mind, whether religious or not, and a regular yoga practice may be a good way to begin that process.